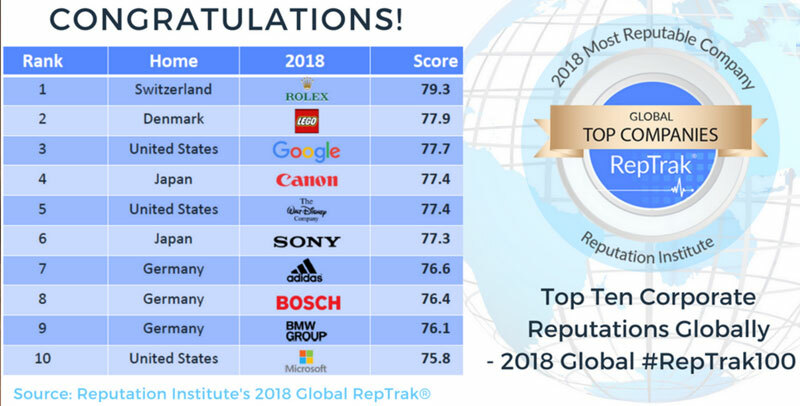 A year has been released ranking Reptrak 2018, with brands that enjoy the best reputation worldwide, formed by 100 companies among which unfortunately contains no Spanish. In fact, This time the perception of the corporate image in general has decreased. Intel and Rolls-Royce are two brands that have fallen in the ranking by the Reputation Institute, Understandably in favor of new. Caring reputation is a fundamental aspect for the image of companies. According to this analysis, Companies with a higher score 80 on 100 They have a reputation 'Excellent’ among customers, but none comes. In this' top 10’ predominate belong to consumer-oriented industries. The perception people have of a company is very important to get to have a market valuation. In the wide world of these, its various findings in relation to economic movements, social and political, They are elementary to build a reputation. This is the first year, after the Great Recession, with a significant decrease in corporate reputation. Ethics, equity and positive social influence are important attributes that remains to improve by companies. Thus, RepTrak 2018, the rnking conducted by Reputation Institute, analyzed and presented this morning at most reputable companies worldwide. According to the results, this list 10 best companies, It has a solid reputation with millennials, where social networks have a positive impact up 2 points in this-, but women of this generation have less emotional connection with companies compared to their male counterparts. “The bubble has burst reputation ". This is the conclusion drawn from the study 'Global RepTrack 2018' of the 100 most reputable companies in the world, Rolex headed. The statement is Stephen Hahn-Griffiths, managing partner and research director of the Reputation Institute, reputable company specializing in prepared annually by the Global RepTrack report includes a ranking of the 100 most reputable companies in the world. According to this study, in 2018 the companies analyzed have fallen an average of 1,4 points worldwide, This represents the first major fall "since the end of the Great Recession". He 58% of the 100 ranking companies have experienced a decline in its reputation, which translates into greater difficulty in obtaining the support of its stakeholders (stakeholders), earn consumer loyalty and tempt investors. The study authors highlight some important changes in classification. So the biggest gains in ranking the experienced Samsung (+44), LG (+22), Nestle (+21) y Netflix (+16), while the largest decreases correspond to Apple (-38), Daimler (-32), J&J (-28), ABInbev (-27) and Estee Lauder (-26). by sector, the place getting more companies in the 10 top positions in the list is the industries consumer oriented, with 6 Business. Stephen Hahn-Griffiths sostiene que “there is a growing crisis of confidence in the world, especially with large companies recorded record profits”. “These companies added the head of Reputation Institute- are judged increasingly by aspects of their morality and ethics. Nowadays, companies are not measured only by what they do or how they do it, but more widely discussed in terms of their alignment with social causes, how to behave, their values ​​as a company and internal culture that create”. The study also highlights the growing interest in the behavior and activities carried out by the CEO of companies: "Beyond the statements about the benefits obtained by the company, voice needs to be heard and the CEO is associated with issues that matter to society ", since the results "show that the reputation of the CEO can have a significant impact on the perception of a company".